St. Andrew's-Sewanee School juniors Andrew Bachman, John Farris, Jack Haight, Abby Mainzer, Dan McNair, Cooper Nickels, Michael Schaerer and Sam Smith participated in the 21st Student Design Competition. This event was sponsored by the Arnold Engineering Development Center during National Engineers Week. Dan and John placed first and received $100 in Amazon gift certificates. Cooper and Sam placed third and received $75 in Amazon gift certificates. "The challenge was to use raw pasta (spaghetti, lasagna, and penne) to create a bridge that would support the weight of at least one brick over a span of about 1.5 spaghetti lengths," said Luke Diamond, SAS Advanced Physics teacher. 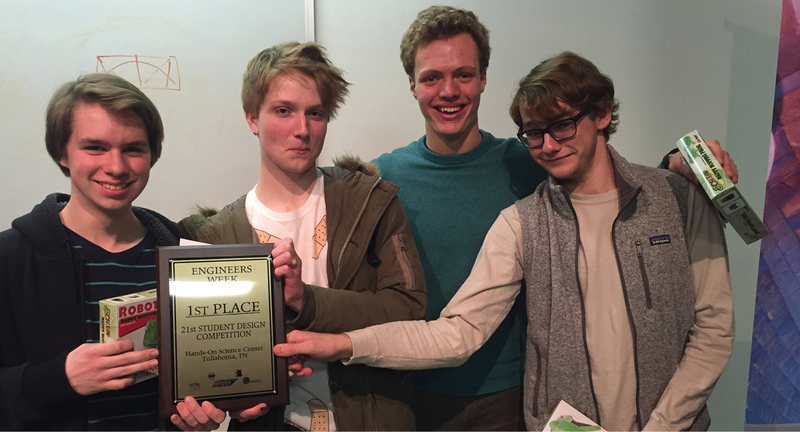 "The challenge was very difficult, and no team successfully supported the weight of one brick." "For our winning teams, neither one of their bridges supported any weight, but their design choices resulted in high scoring designs," said Diamond. "Our other two teams built bridges that actually supported the weight of a bucket and chain, but not a brick. Abby and Michael designed a bridge that supported the weight of the bucket for about two seconds before breaking. Andrew and Jack designed a bridge that held the weight of the bucket and chain for at least five seconds before it collapsed when a brick was added," said Diamond. For the design challenge, high school students in grades 10, 11 and 12 compete on two-person teams to design, build and compete their design against other teams. The students do not know what they will be asked to design until they get to the competition. Teams were given kits with identical materials and an hour and a half in the morning to design, build, and test. After lunch, the teams competed their designs against each other. Prizes were awarded to the top three scoring teams.